*Gillingham fans CAN pay on the day. 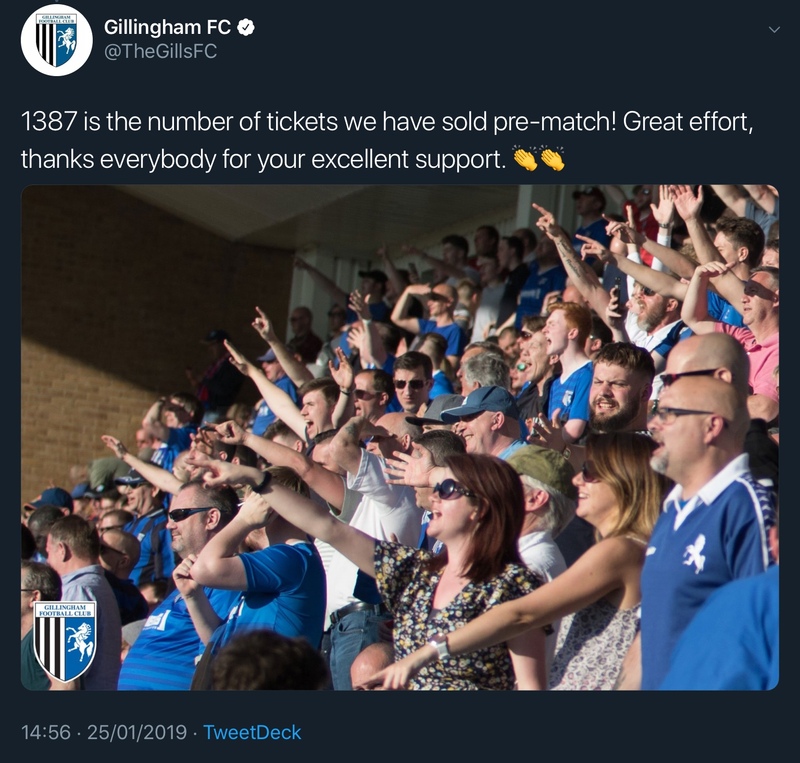 Gillingham have sold a total of 1,387 tickets from their allocation of 2,077. Predicted crowd will be about 12,000. This in my opinion is a really big match! Last season we went out with a whimper, after a good run of home wins after drawing 3 matches away from home. Newport County had shown last season how Spurs could be made to look quite ordinary in their 1-1 tie. We on the other hand were abysmal in our quarter final. They'll turn up in brown Major Domo's and Army trousers. Who will? And who is Major Domo, and what’s so special about his trousers? Hope we take this seriously. 1) Strong team selection (Villa suggests GP will) 2) Decent turnout. Baffling how we couldn’t sell out an FA Cup Quarter Final last season even with Spurs taking 3,000. Get behind our team. We are 4 games unbeaten. I am not sure why people wouldn't want to attend a cup game. Is it that some have paid for their season ticket and are too tight to pay for a ticket? Or what? £7.50 for a seniors ticket. Got to go for that price surely. We shouldn't all be tarred with the same brush you know! Oh yeh, 5 games unbeaten. 80% of our away games are a long way, we take thousands away some weeks. Big game for Gillingham fans ? I disagree on not a big game for us. I want us to win the fa cuppahhh every season. This is another game towards getting the triangular flags and shoving 1927 up the arze of our eastern cousins. Therefore big game for us. If we sell/giveaway Dan James this week, I can see a really low turnout for this. Never mind kids for a quid. Only £1.50 online and NO booking fees for children. ST holders who does quite a few away games every season for close to 40 years. I have little interest in the FA cup & wont be attending. Then go and support them. I hate cup games because we have half arsed support millions of kids, pi$$ poor support and then an eternity of cyber warriors whining about the owners if we lose. I like you. Don't push it! Possibly make the effort but it won’t happen. I’m quite excited for this match. I hope we play a strongish team. It worries me that Birmingham is so close on the Tuesday and that there might be a lot of changes. It was great to see the strong side we put out against Villa. There will hopefully be a lot of youngsters going. Gillingham will be bringing about 1,500. I think he's will put a strong side out and go for the win.